1.1 What are the Characteristics of Cherry Angioma? Cherry angiomas are quite common types of vascular lesions that appear on the skin. They are usually dilated capillaries or the excessive clumping of blood vessels. They may appear as cherry-red papules or purplish in color. Cherry angiomas are also known as Campbell De Morgan spots after the British surgeon who first took notice of these clusters of lesions. Senile angioma is another name given as its proliferation increases over age. Cherry angiomas are known to increase with age, specifically after 40 years old. 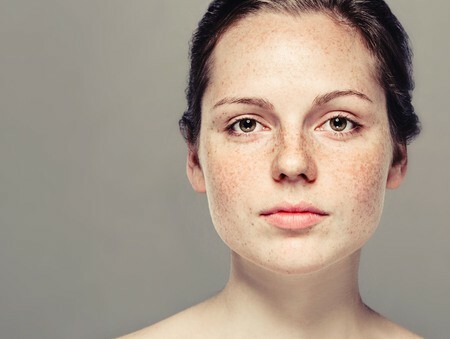 The exact cause is still unknown but it can appear to any areas of the skin. Most often they appear on the torso. These are non-cancerous growths made of blood vessels. What are the Characteristics of Cherry Angioma? 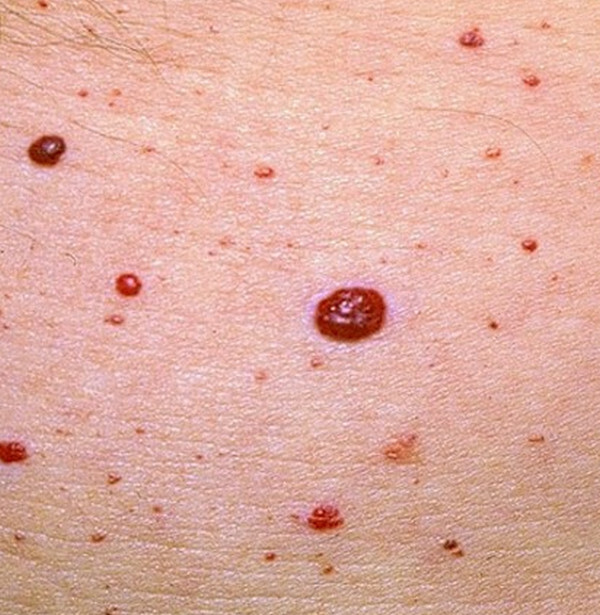 Cherry angiomas usually appear like bright cherry-red papules or are purplish in nature. They would occur in any surface area of the skin but is most common on the trunk or the torso. The face, scalp, neck, arms and legs are also probable sites for the development of cherry angiomas. 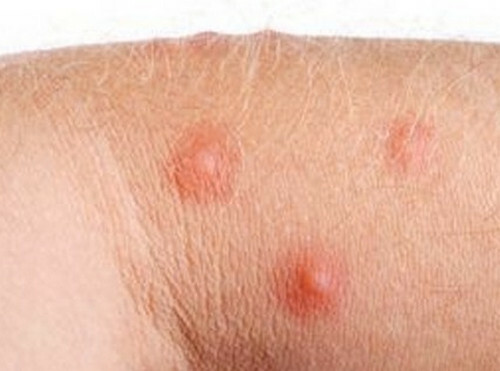 The papules seldom appear on the hands and feet. The papules may be flat topped and may start as small dots or pinheads. They are usually quite smooth or they can be elevated and stick out from the skin. Cherry angiomas may increase in size and diameter. They would also tend to expand in thickness as it continues to grow larger. Some cherry angiomas may adapt a mushroom or dome shape as it becomes larger. 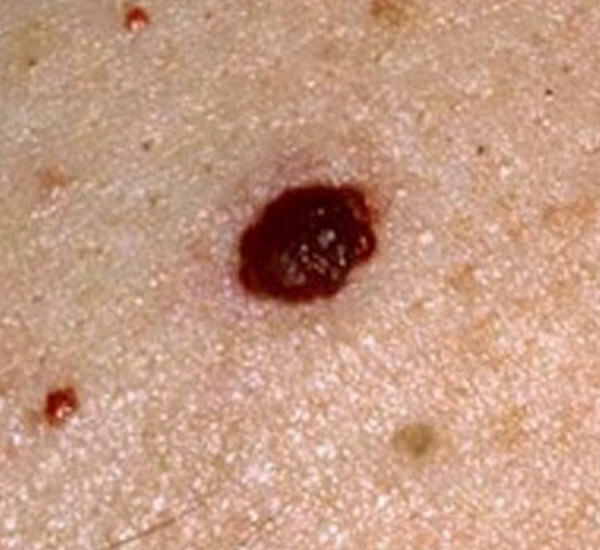 Polypoid angioma is the name given to several adjoining angiomas. The cause of the development of cherry angiomas is idiopathic in nature though they have been linked with genetic tendencies. This lack of information is probably due to the disinterest regarding the subject as these lesions are usually benign and rarely indicate malignancy. Cherry angiomas usually occur after 40 years of age though they may start appearing as early as 30 years old. However, there may also be incidences when they start to appear spontaneously in younger people. Angiogenesis refers to the growth and formation of new blood vessels from current and existing blood vessels. Vasculogenesis, on the other hand, refers to the formation of new blood vessels as they are and without any pre-existing blood vessels. Certain chemicals and compounds have also been linked with the development of cherry angiomas. These include but are not limited to bromides, butoxyethanol, cyclosporine and mustard gas. An increase in mast cells, which are cells usually rich in histamine and heparin, has also been associated with the proliferation of cherry angiomas. Diagnosis for cherry angiomas is usually made on the basis of the physical appearance of the lesion growth. 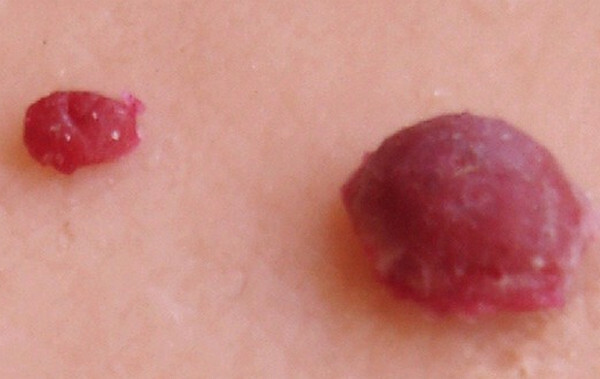 A skin biopsy may be indicated to confirm the diagnosis. Usually there are no other laboratory studies that may be required unless histopathologic confirmation is necessary to rule out malignancies. Cherry angiomas may or may not be treated as they are usually harmless or painless. The main reasons, however, for their removal is for aesthetic purposes as well as if the lesions tend to bleed frequently. This is the use of extremely cold temperature to eradicate abnormal tissue. Ice crystals would form around the cells until such time that the cells would tear apart. The blood vessels of the abnormal tissue are also damaged when they become frozen. Argon, carbon dioxide, liquid nitrogen, dimethyl ether – propane are the most common chemical compounds that are used for this procedure. It is not as invasive as other procedures and causes minimal pain and scarring. Localized pain and redness may be managed with analgesics like acetaminophen, aspirin and ibuprofen. In addition, it is a cost effective therapy. The risks associated with cryosurgery are damage to the nerve tissues and scarring. This procedure utilizes the application of an electric current to the abnormal tissue to destroy it. Electrosurgical devices are used and alternating current is used in directly heating the tissue. The risk of scarring may be avoided if done by a skilled professional. This procedure uses heat conduction by an electric current through a heated metal probe. This procedure is different from electrosurgery due to the differences in the electric current used. However, the use of electrocautery has been controversial because of the toxicity of the surgical smoke emitted during the procedure. This procedure makes use of an organic dye as the active laser medium. The dye would usually come in a liquid preparation but can also come in solid or gas state. This procedure utilizes various wavelengths in targeting various skin treatments including removal of vascular lesions. It is much more commonly used as a form of hair removal technique. However, there may be contraindications for the application of this treatment, which include seizures, sunburn, hypertrophic scarring and moles. This is done by removing the lesion through the use of a blade. Bleeding may be stopped through the use of aluminum chloride or electrocautery. There are also natural remedies, which may be used in treating cherry angiomas. These remedies utilize natural ingredients provided by nature. Sandalwood powder may be mixed with fresh basil leaves to make a paste. Crushed leaves of strawberry may also be used. Witch hazel is also helpful in eliminating bacteria after a shower. Although cherry angiomas are usually not dangerous and need not necessarily be treated, it is important to have them checked by a dermatologist if multiple angiomas are noted in a short span of time. This is important to rule out internal malignancies. In addition, it is important to remember that the cherry angiomas should not be punctured because of their risk to bleed profusely. it seemed to me that they are viral in nature, i.e. with close contact appear in humans.